Check out these 14 meaningful and free Christmas crafts for kids. It's easy for everyone to get wrapped up in the carefree spirit of the holiday season. Shopping, baking and decorating seem to move to the top of everyone's priority list, and sometimes the true spirit of the season can get lost in the shuffle. Songs about Frosty, Rudolph, and Santa dominate the radio and sometimes the meaning of Christmas gets lost and forgotten about. If your kids think Christmas is all about baking cookies and getting presents, try making these easy kids crafts as a reminder about the meaning of the word Christmas. Instead of spending the weekend shopping, spend some time with your kids making simple homemade Christmas ornaments and homemade Christmas decorations to help deck the halls. Kids will love seeing their handmade creations around the house, and making these quick easy holiday crafts will surely be one of your favorite memories of the season. Make learning fun with these free Christmas crafts for kids! Call on your kids to help deck the halls this holiday season with these sentimental homemade Christmas decorations. Don't rely on pretty twinkle lights and sparkly garlands to get the decorating job done. Take this opportunity to make some truly meaningful adornments and teach the true meaning of Christmas for children by making these quick easy holiday crafts. Teach them about the North Star and the nativity, as well as the importance of friendship and peace during the holiday season. Make trimming the tree a special learning experience with these meaningful ornaments. Out of all the free Christmas crafts for kids, ornaments are the best to make with your kids; they will enjoy seeing their homemade Christmas tree decorations adorn the tree throughout the season. Jesus, angels, and stars hanging from the branches of your tree will help remind children that there's much more to Christmas than presents, candy canes, and gingerbread houses. Once the tree is trimmed and the halls are decked, you can still teach the true meaning of Christmas for children with the help of these other free Christmas crafts for kids. 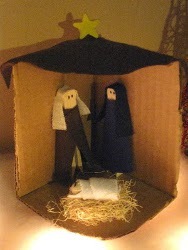 Children will have fun learning more about the nativity with these interactive nativity crafts for kids. 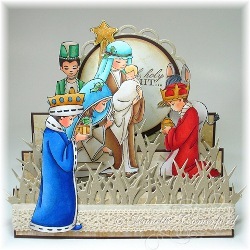 If you're sending out family holiday cards, solicit their help to make a nativity card. Although it's fun to shop and find the perfect gifts for your loved ones, it's important to also remember the meaning of Christmas and pass it along to your children while they're young.